Earn up to 10,360 reward points. Don't be afraid to feed this little tone beast after midnight. There’s nothing quite like the sounds of a cranked-up blackface or tweed-era guitar amplifier; but, getting those tones at the reduced volume levels modern players often encounter has been increasingly difficult. Until now. 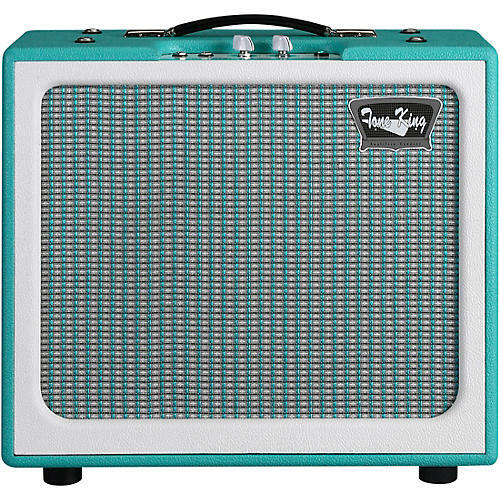 Introducing the Tone King Gremlin 1x12” 5-watt all-tube combo. Whether you’re picking at home or keeping up with a drummer, the Gremlin dishes out enough vintage-vibe to inspire. The amp’s two inputs and simple control layout make finding your tone an intuitive process. Plug into the Rhythm channel for a more blackface tone with bell-like highs and increased headroom. Or maybe the Lead input’s tweed-style drive is more your flavor. Thanks to Tone King's Ironman II power attenuator, on the back, you’re able to enjoy all of the juicy goodness of maxed power tubes at a level that won’t wake the neighbors. If you're drawn to the American-side of cranked vintage amps, your tone is in the Gremlin. Even at 5-watt, the Gremlin is plenty powerful to keep up with most drummers. But Tone King added Ironman reactive load power attenuator right onboard to get that same sweet amp drive at bedroom levels. Experience the screaming tube tone we all crave, at a volume everyone will agree on. Tone King engineers went through great lengths to design a cabinet and custom Celestion 12" 870 speaker that deliver the wide dynamic range of a larger tube amp, while always retaining the Gremlin’s vintage character. All in a size that will easily fit in your car, bedroom, or even a cramped performance stage.